But all these various creatures, whether they exist in their own right—i.e. are independently conscious—or not (and this distinction is not always easy to make simply by looking at them), are of interest only to the lover of variety, to the collector of strange objects. To suppose, as Huxley does (and it is this fidelity of his to the scientific method that condemns him never to be more than a second-rate thinker), that by collecting and examining the various objects of the mind one can learn something essential about the nature of mind is much the same as supposing that one can learn something about the structure of the telescope by making a list of the great variety of objects one can see through it. The phenomenological method (of existential thinkers) is not in the least concerned with the peculiarities (however peculiar they may be) of the individual specimen; what it is concerned with is the universal nature of experience as such. Thus, if a phenomenologist sees a duck-billed platypus, he does not exclaim with rapture 'What a strange creature! What a magnificent addition to the sum of human knowledge (and also to my collection of stuffed curiosities)! '; he says, instead, 'This is an example of a living being', thus putting the platypus with all its duck-billed peculiarities 'in brackets' and considering only the universal characteristics of his experience of the platypus. But a dog would have done just as well; for a dog, too, is 'an example of a living being'; and besides, there is no need to go all the way to Australia to see one. The phenomenologist does not seek variety, he seeks repetition—repetition, that is to say, of experience (what it is experience of does not interest him in the least), so that he may eventually come to understand the nature of experience (for experience and existence are one and the same). And this is just as true of imaginary (mental) experience as of real experience. The Ven. 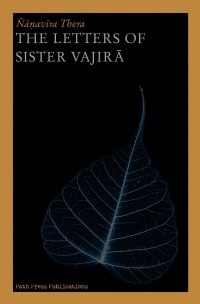 Sāriputta Thera, for all his proficiency in the practice of jhāna, had not developed the dibbacakkhu (Thag. 996). And even so he was the leading disciple of the Buddha, and the foremost in paññā, or understanding. 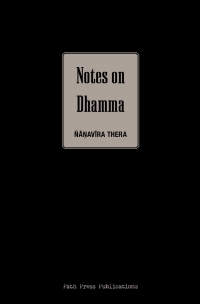 After the Buddha himself there was nobody who understood the Dhamma as well as he—and yet, on his own admission, he was unable to see 'even a goblin' (Udāna IV,4: Ud. 40). Evidently, then, the seeing of strange creatures, in normal or abnormal states of mind, does not advance one in wisdom. When one is dead one is at the mercy of one's publishers (a strong argument for staying alive! ), and I do not know how many of the late Ven. 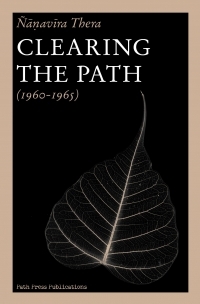 Ñānamoli Thera's essays (in the BPS booklet) he would have wanted to appear in print. Naturally, I was aware of many of his views, since we used to exchange lengthy letters; but that was at a time when my own views were still unsettled. On reading these essays now, I see much that is quite unacceptable—but alas! he is no longer here for me to dispute the matter with. He was, in my opinion (and perhaps also his own), a better poet than prose writer; nevertheless he manages to infuse a certain sympathetic personal (and somewhat ambiguous) atmosphere into many of his passages. 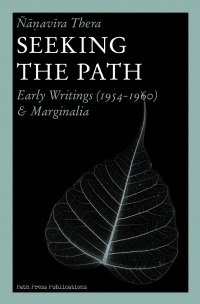 I would suggest a certain caution in reading these essays with too great a thirst for philosophical enlightenment—you might find yourself led into one of the blind alleys of thought from which the author himself is unable to show the way out (the last essay in particular is dangerous ground—so also pp. 27-30)—, though from other aspects, perhaps, you may well derive enjoyment.